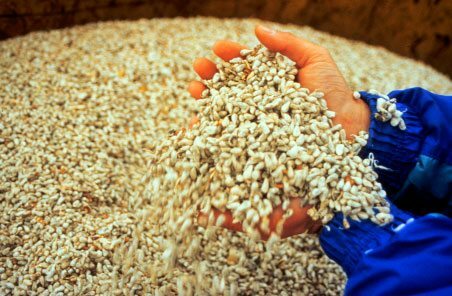 Cottonseed that handles like whole shelled corn? That’s how Tom Wedegaertner, director of cottonseed research and marketing for Cotton, Inc. tells it. A new process developed by the cotton grower checkoff organization encapsulates cottonseed in a light coat of cornstarch, pasting down the lint and improving the seed’s handling characteristics. The end product, dubbed EasiFlo, offers new opportunities for feed suppliers that have previously been unable to handle cottonseed. In 1993, Cotton, Inc. began research on a process to improve cottonseed’s flowability, working with a company experienced in coatings for candy and pharmaceuticals. “The company developed a beautiful coating, but it cost $4 a pound,” says Wedegaertner. “We were putting 100 pounds on a ton of cottonseed, so the coating alone was worth about $400/ton. But it showed that the process was technologically feasible.” The organization then began investigating ways to make the process economically feasible. It took about three years of research testing various coating materials and equipment to reduce the cost to roughly $20/ton. The EasiFlo process is “almost embarassingly simple,” says Wedegaertner. Feedgrade cornstarch is mixed with water and heated to near boiling. The gelatinized paste is “smeared” onto the seed using a simple mixer device. The seed then passes through a belt conveyor dryer to prevent water from penetrating the seed. The end result is a hard, durable crust that seals the lint. Such answers are forthcoming, says Wedegaertner. Studies at Penn State and the University of Wisconsin are testing the durability of the coating; potential shelf life of the seed; and reaction to humid conditions. “So far that research looks better than expected,” he states. “The coating seems to be very durable, and seems to have an adequate shelf life. It doesn’t take up moisture any differently than fuzzy cottonseed.” Final results of these studies are expected by the end of the year. Research on the product’s nutritional properties also indicates no apparent nutritional differences between the coated and fuzzy seed. In fact, the studies showed a slight increase in dry matter intake and milk production in dairy cows consuming the EasiFlo. Follow-up studies will take a closer look at these areas. A harder question to answer concerns the cost of commercial production. “I don’t think there will be a problem with the product itself being accepted,” Hanson says. “The biggest challenge will be the cost of manufacturing the product, and the premium required in the marketplace to offset that cost.” While he foresees Cenex/Land O’Lakes mills using EasiFlo in the future, he says it will depend on the premium the marketplace demands. Cotton Inc. has signed its first commercial licensing agreement with Commonwealth Gin in Windsor, VA. While the product won’t be commercially available until March of 1998, Wedegaertner anticipates EasiFlo will sell at a $30 to $50/ton premium to fuzzy cottonseed. The EasiFlo coating process is creating new product opportunities for cottonseed, including use in range blocks. “Any mill that makes protein blocks can use the coated product,” says Cotton Inc.’s Tom Wedegaertner. The cottonseed can be added to the mix and pass through standard block equipment. The first several runs of EasiFlo produced were used to make both pressed and poured blocks up to 500 pounds. While the feed studies aren’t complete, initial results have been promising. “EasiFlo opens up another opportunity for mills to use cottonseed in products they hadn’t thought of before because they couldn’t physically get it into those products,” says Wedegaertner. But the benefits will help offset those cost concerns, says Wedegaertner. EasiFlo’s increased bulk density (27 to 28 pounds of Easiflo fits into the same space as 22 to 23 pounds/cubic foot of untreated seed) and the ability to use hopper-bottom equipment should reduce shipping costs. Reduced equipment and labor at the mill should further offset the higher price per ton. Wedegaertner estimates the final premium delivered at a Midwest mill will be roughly $20 to $40/ton. As demand for EasiFlo increases, cottonseed growers will likely see greater price stability. “We’re not going to see $80 cottonseed anymore,” Wedegaertner predicts.